Today marks the one year anniversary of buying Opie! 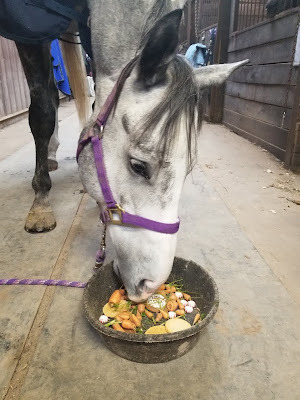 To say he has made all of my Training level dressage dreams come true would be an understatement a lie--because I didn't have any. I think it's safe to say he's exceeded all my expectations, and he has been hands down the most fun, enjoyable, rewarding horse I have ever owned in my life. To quickly recap Opie's previous life, he raced for three years, from two to four, 31 times exclusively at Finger Lakes. His last race was 10/2/17 where he finished ninth...and second to last. 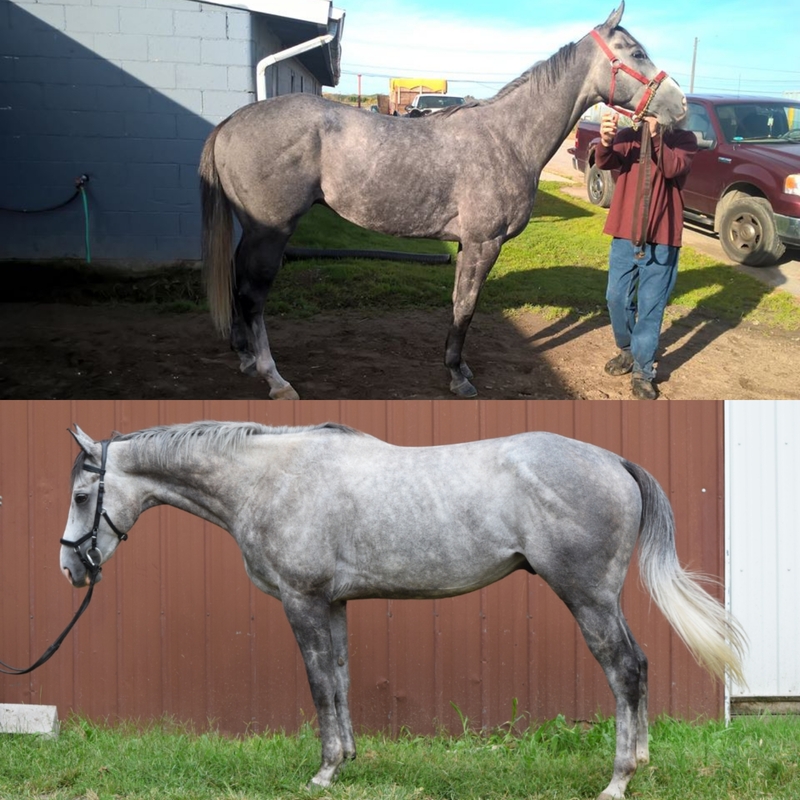 He was actually entered to race the Monday after I bought him, but instead he had a "vet scratch" to go to "Cornell to get scoped." AKA "Put the horse on your trailer, the $1k you're paying us is more than he's earned in the last two years combined." he was cute to start, but i like to think i've made him cuter. Instead of racing that Monday, Opie got his first post-track ride. My checklist for my new horse was simple: gelding, brain, farrier approved feet. (And no grey. But that was a clear fail.) Right away, all the gushing his trainer--"Oh Opie? Nothing bothers Opie." --and his groom--"The last time this horse won he looked like someone was chasing him, and he's never run that fast again." --did over him while I was shopping was immediately apparent. We did w/t in the indoor and after all of ten minutes I had to kick him to keep him going. He had Carly Boot Camp to attend though, as he also ran over my barn mate and then BM at the mounting block. 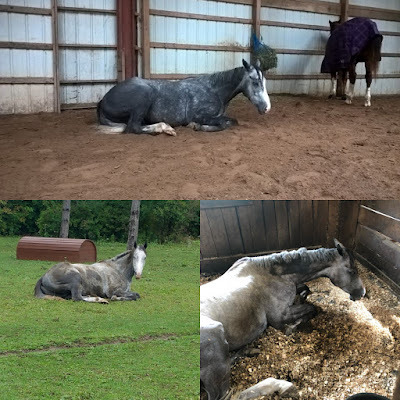 He weaved horribly in the crossties, he had no patience to stand still under saddle, he tried to lay down on the farrier, and when he set his sights on an adventure he was dragging you along with him. But I quickly found that the key to Opie's heart was candy, and in a month or two he learned that standing equals candy and literally all our problems went away. The biggest hurdle was definitely death box training, but a winter of being persistent and patient led to a spring with only a couple of mild loading and unloading setbacks, and by the time his extensive show season wrapped up, he certified himself as automatic with the trailer. 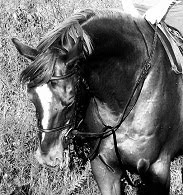 I can take him with another horse or by himself and trust him to get on the trailer, hang out tied, and then get back on again without any drama. Speaking of show season! 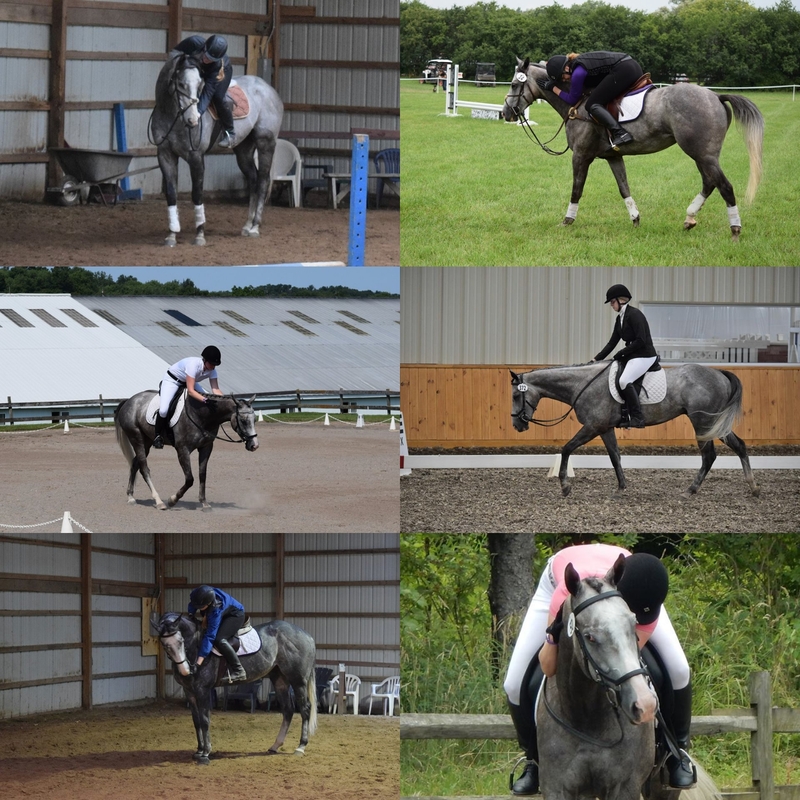 Opie did ten dressage shows this year--five recognized and five schooling. 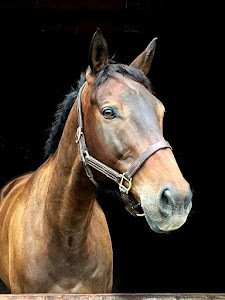 He collected 70s and even an 81% at schooling shows, and consistently scored in the mid-60s at recognized shows, including a 68% to win his class at his second show. He's learned to let his cobra neck get long, and aside from being #childgenius he's proven to be super willing and capable of dealing with pressure--two things Bobby never had going for him. While the vast majority of our time is spent focused on dressage (or trail riding), he also gradually got introduced to jumping. He was horrible with body awareness when I got him though, and couldn't figure out how to stay on his feet to save his life. 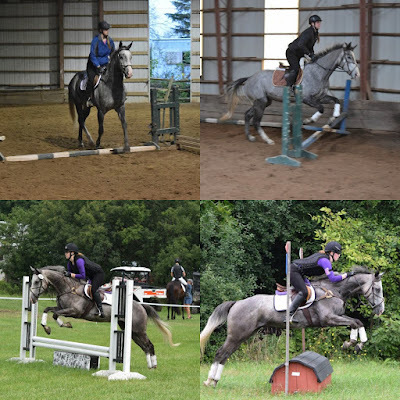 He got to play with some tiny jumps over the winter, but as show season kicked off that pretty much got scrapped which turned out to be the best thing for him. 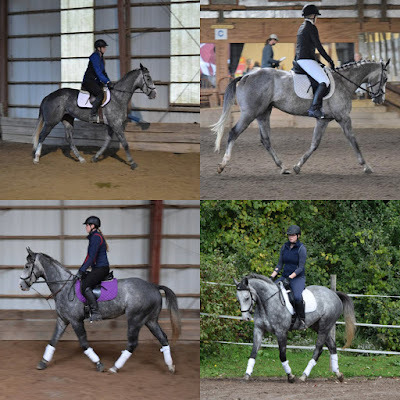 All the dressage and trail riding made him figure out his moving parts and beefed him up in the strength department. When I re-introduced fences, it was like he'd already been trained over them. 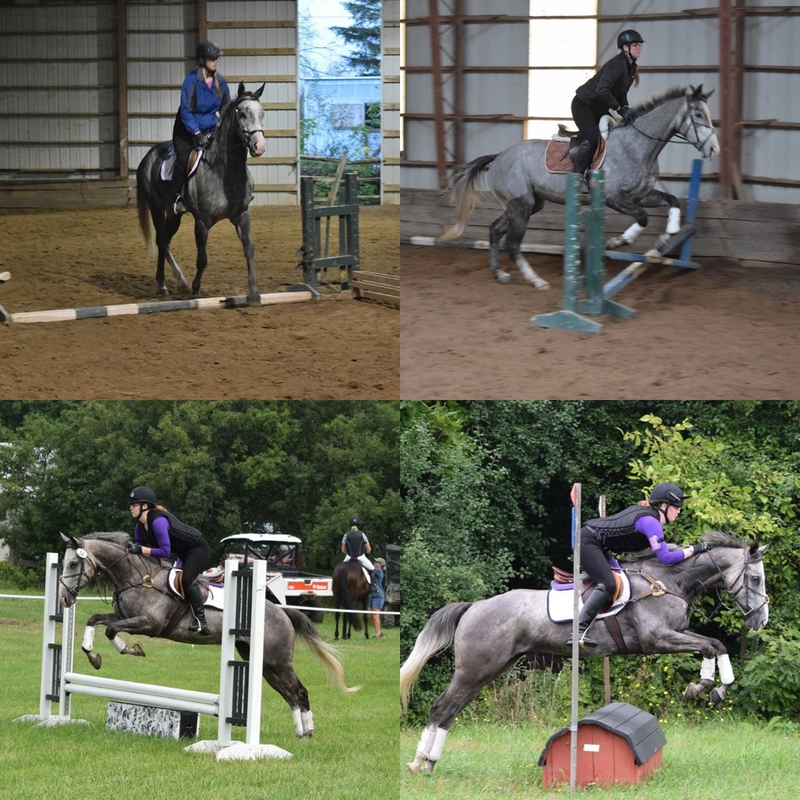 If I tried, I could still probably count the exact number of times he's had a jump school because it's been that few, but he's still managed to jump up to 2'9" xc, a couple 2'6" stadium fences, and full courses at Intro (2'3"). AND, most importantly, I haven't even used up my very first bottle of Cowboy Magic and I'm a stickler for a clean, spot-free horse. So he's basically a unicorn. Extra cookies and candies day! He's turned out to be pretty okay! He's such a great unicorn! I've loved following along - it's amazing it's only been a year. He's exactly what I'd want in an OTTB if I ended up with one someday! 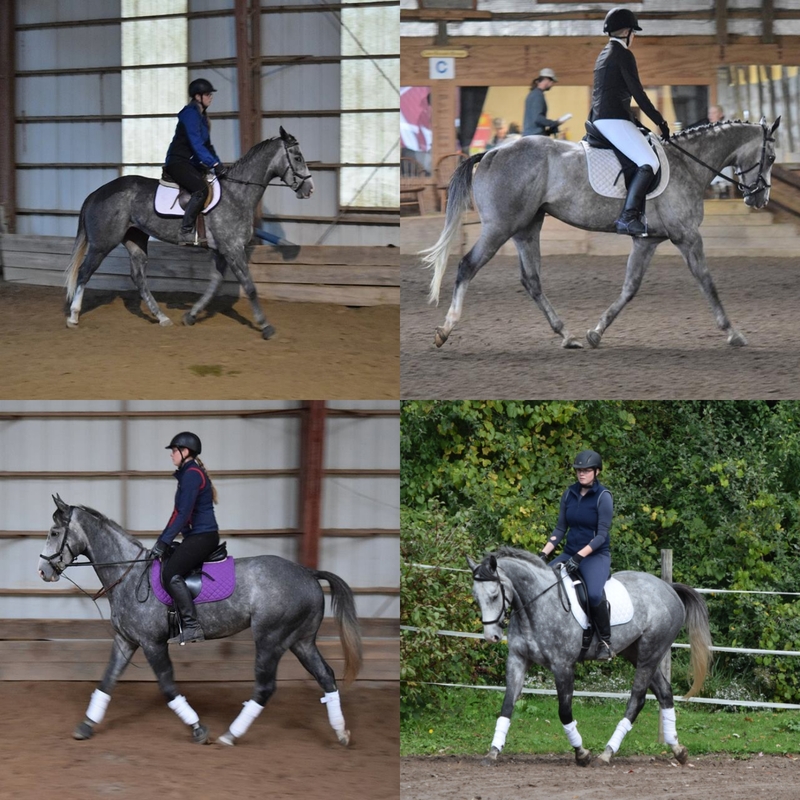 He definitely gives OTTBs a good name! Aw he’s so cool I love him <3 I’m so glad you found him, happy horseiversary and many happy returns!! It was impossible to pass up on that snoot! Yep, that second pic was a month ago. He's had some awkward AF growth spurts, but he finally seems to be evening out for good now. Happy Anniversary. I love the top photos that show how much he's changed. Wow. What an incredible year and WOW that before/after. He's a dreamboat. He's really looking like a grown up horse lately! I can't believe the change in just one year. It's incredible what you two have already accomplished. And you forgot to mention he's a driving horse now too! Omg you're right! Rides and drives! One year of the best child genius!! Dopie is Da Best <3 Happy anniversary!! Takes an amazing midget horse to know an amazing midget horse! Happy Gotcha day! What a gorgeous guy he is. Happy gotcha! You have done such a lovely job with your boy!